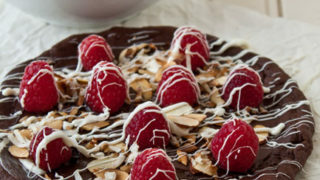 I can’t think of a better way to showcase fresh summer raspberries than with layers of chocolate. I mean, of course, after you eat your share of fresh berries right out of the bowl. (And by ‘bowl’ I mean right out of the carton on the way home from the farmer’s market). The crust for this pizza is a chocolate sugar cookie. The dough comes together quickly. Use your fingers to pat it out into a 6″ circle, and pinch the sides slightly to create an edge to hold the melted chocolate. After a quick bake in the oven, sprinkle chocolate chips on the dough immediately. Slide the whole thing back into the oven for 1 minute. Next, use a knife to spread the chocolate chips into a single melted chocolate layer. So easy! We didn’t have to deal with double boilers or melting the chocolate in the microwave—the oven does all the work for us. All we do is spread, spread spread, and lick the knife when we’re done. Spread, spread, lick, spread. Got it? 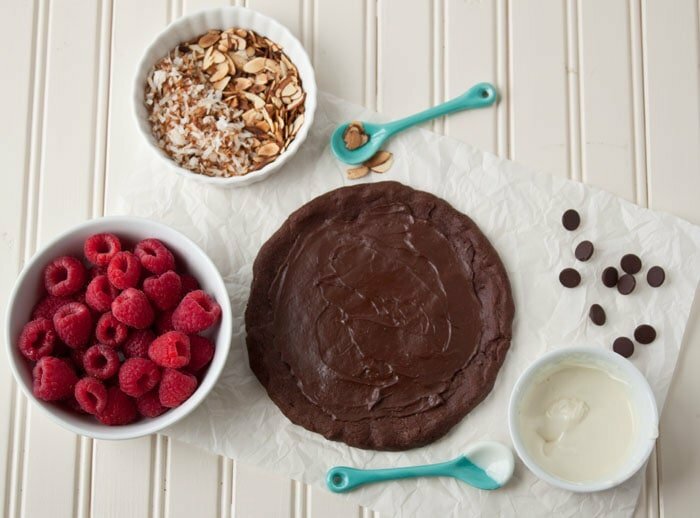 You can top your chocolate pizza with anything your little heart desires. I used toasted coconut and toasted slivered almonds for crunch. I drizzled melted white chocolate on top. I’m dreaming of a version with blueberries and orange zest. Or, cherries and salted caramel drizzle? Am I making you drool yet? First, make the crust: In a small bowl, stir together the butter, sugar, egg yolk and vanilla. Stir the mixture very well, smearing the sugar into the butter until it's well-blended. Sprinkle the flour, cocoa powder and baking powder on top. Stir until just combined, but don't over-mix. 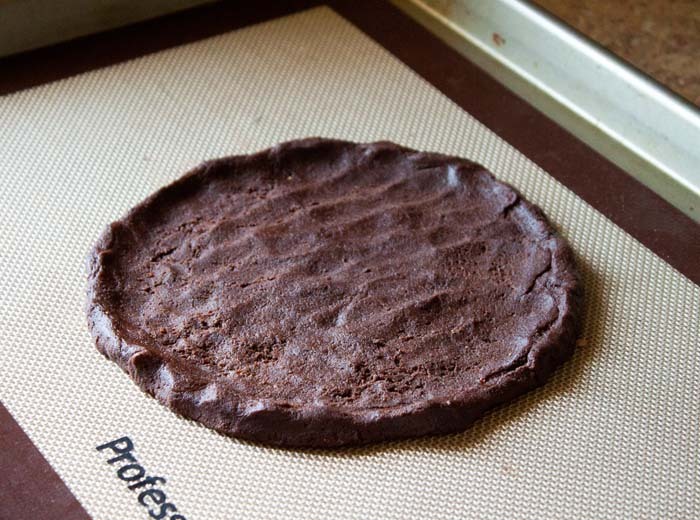 Scoop the mixture out onto a cookie sheet lined with parchment or a silicone liner. Shape the mixture into a 6" round disc, and then use your fingers to gently make a slight lip on the edge. Bake for 9 minutes. Remove the cookie from the oven, sprinkle the chocolate chips on top, and immediately return it to the oven. Let it bake 1 minute more to melt the chocolate chips. When you remove the cookie from the oven, the chips won't look melted: use a knife to spread them and they will melt easily. 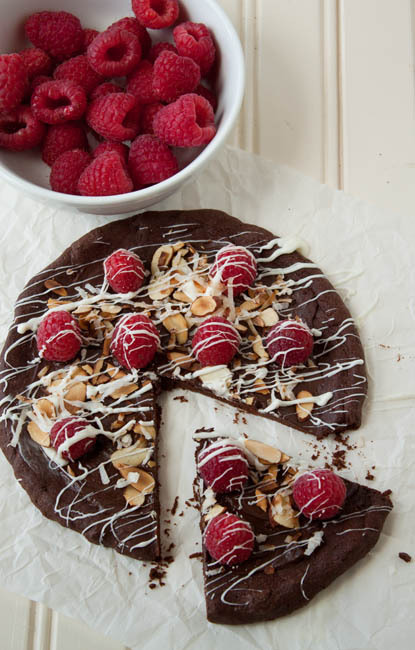 Top the pizza with the coconut, almonds and raspberries. Drizzle the white chocolate on top. Serve in slices. What a great use of raspberries! That combination with chocolate is stellar and I do love a good dessert pizza. Is it terrible that I would leave all the “healthy” stuff off and eat it as a big chocolate cookie? Yep, I would totally be down with that. You know when you stumble across a blog and immediately add it to your feed reader because you just KNOW it’s going to be a firm favourite? Well, I just had that with this. Chocolate pizza! That is so fun! Such a great idea! Holy Hannah. This just came into my inbox and I think the baby woke up from my excitement! I might take a note out of Max Brenner’s book and use Nutella for the “sauce”, but I want to make this for breakfast. This looks like a great dessert to double and serve to dinner guests. And I’m already thinking of all the topping combinations that would work well together! Chocolate pizza? What an awesome idea. I love that the base is a proper cookie/dessert not a pizza-like dough. And am totally with you on fruits – in love with pretty much all berries out there at the moment. Daaaang, this looks awesome! Such a fun idea! Chocolate and pizza! Who wouldn’t want this!! Welp, I know what I’m making for dinner! ;) But seriously, this treaty pizza looks insane and I love that the crust is a chocolate sugar cookie. Yup, berries have been amazing this year! And we’re even getting some good peaches over in CA, which as you know is pretty unheard of! Hope you had a wonderful weekend, mi lady! 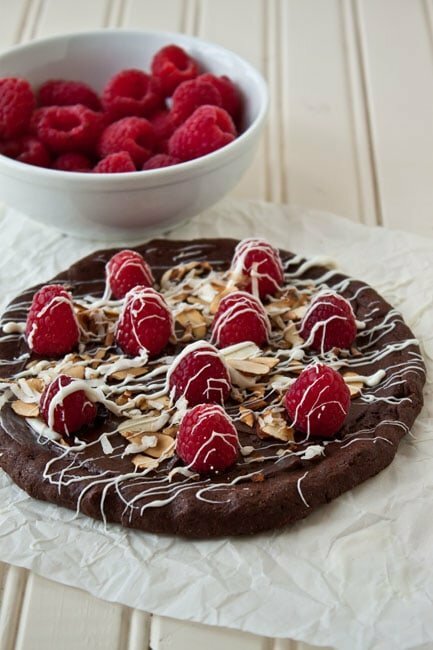 Cookie pizza with raspberries! Yes, like a million times yes!!! Just beautiful. Oh my, this is just perfect! Holy gorgeous deliciousness! This HAS to happen in my kitchen… and in my mouth. I love this. If it serves two, then I will take two pizzas because one serving won’t be enough! This recipe is just so adorable. And I’m glad to know it’s not just me who gets impatient and eats berries on the way home from the market/store. :) I would eat a pint of raspberries every day if I could afford it! There is nothing wrong with eating the berries right out of the carton. I usually buy two cartons, one to snack on and one to bake/cook with. I agree, the berries are extra delicious this year! Oh my heavens, that looks amazing! Pizza with a chocolate crust and fresh berries? Seriously! Saw this on pinterest and ran straight over. LOVE IT. What a FANTASTIC idea!! Dessert pizza seriously sounds like something amazing. I can promise that I’ll try this out, but even more I feel like this could be the next big dessert trend (after cake pops)! This is so awesome. I adore chocolate and raspberries together! I’m definitely drooling! And I completely agree that this year’s berries have been extra delicious! I think this would be perfect for a date night in! Yum! I’m pretty sure that is heaven in a cookie crust!! I’m totally wiling to scrap my diet for one of THESE! Also, did you go and get a new look and I missed it? My head has been spinning lately! Anyhow, love it! Oh, finding perfectly sweet berries is the highlight of the season, no doubt. Now, this is a wonderful, fast and gorgeous pizza idea! I’ll take a slice of this lovely dessert any day. yum! now that’s a pizza that I could find myself wanting to eat everyday! You my dear, are a genius. GENIUS! Love, love, love this idea for fresh raspberries! Chocolate and raspberries (my fave!) rule and I like how the oven does the “dirty work” of all the melting (less dishes) and that you added proper crunch with almonds and coconut. Mmm! Beautifully executed, my dear! Oh my! This pizza is so decadent, what an incredible treat :) I love this idea! Um, GORGEOUS cake. Those raspberries look unreal!! Chocolate and raspberry is my all-time fave! This sweet pizza looks amazing! what a brilliant idea! and I love chocolate and raspberries together! I CAN NOT believe that I am just finding your site. I am Southern as well from (TN) but living in Saudi Arabia for the past 5 years booo lol. Anyway, I also have a food site and have a few small batch recipes bc I hate making more than my husband and I can make. We have a son but he’s picky and never usually eats what we do anyway. I made two of your cakes today for my husbands birthday and it was a hit, thanks. “I can’t think of a better way to showcase fresh summer raspberries than with layers of chocolate.” Girl, we are on the same wavelength! This is a gorgeous pizza, and must be heavenly to eat. And I think cream cheese needs to be involved here. It just does. ;) Definitely going to try this at some point! What a brilliant idea! Looks lovely!